Get 200+ of our best articles and resources compiled into 400+ pages in all three e-reader formats (PDF, .mobi for your Kindle, and .epub for your Nook) for one low price. We’ve worked hard to make all of our articles jam-packed with insightful, actionable information, and now we’ve put it all together in one convenient resource! 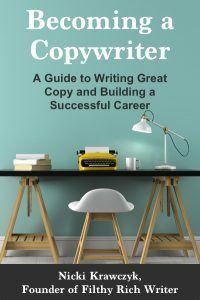 Our raved-about, self-paced Comprehensive Copywriting Academy offers you everything you need to learn both the fundamentals and advanced tactics of writing copy—plus how to build a business and a career, from your very first clients through to big ad agency clients and jobs. Click below to learn more. NEW! For the first time ever, you can now purchase select courses and and course packs from our Academy repertoire. 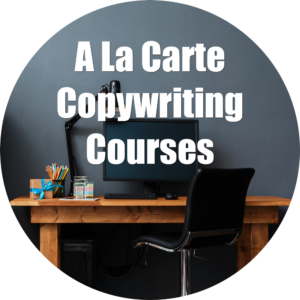 We’ve carefully selected (and sometimes bundled) courses to help you for wherever you are on your copywriting journey: We have courses/packs for everyone from newbies to working pros. Click below to learn more.